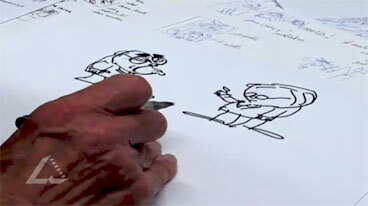 Video clip synopsis – Bruce Petty demonstrates his representation of key Australian political figures. Broadband MP4 bpetty2_bb.mp4 (7.1MB), suitable for iPods and computer downloads. Collect a range of political satire cartoons from newspapers and online sources. Analyse the styles of the cartoonists in regard to the way they draw famous Australian and international political figures. Look at the way they emphasise facial and other body features, tallness and shortness, clothing, hair and posture. Select one or two cartoons and assess them with regard to how accurately they express the character of the political figures in them. Write up your assessment setting out how the cartoons achieve the aim of expressing the characters of the political figures depicted. Observe closely the way cartoonist Bruce Petty draws the Prime Minister. What features does he focus upon to characterise Mr Rudd? How successful is his characterisation? He goes on to draw Mr Joe Hockey, Shadow Minister for Health and Ageing. How does that drawing compare to the drawing of Mr Rudd? Try your hand at political cartooning. Collect some photographs of Australian politicians from newspapers or online. Select one or two as the subject matter for your cartoons. Research some current affairs in which they are involved so that you can combine your characterisations with a relevant topic. Practise your cartooning techniques before you produce your final piece. Look for specific things to emphasise in your practice. Once you are satisfied that you have developed an effective characterisation, create your cartoon on the topic relevant to your political identity or identities. Present your cartoon to others in the class; if possible, have them all displayed together.